The bay leaf tree is laurus nobilis. It can grow to huge proportions if left unchecked - up to 40 feet high. It is highly aromatic and ornamental with lovely glossy dark green leaves. 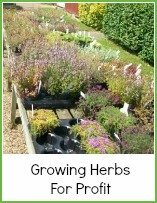 Whilst this may be good if you have a big garden, if you're wanting to grow it in your herb border, it will take the nutrients and sun away from everything near it. One bush or tree will be ample - you tend to use one leaf only at a time. You need to keep it pruned. Normally, you would buy a bay tree around 9 inches to 2 feet high - the larger the plant, the more expensive it will be. Many people like to grow them in large tubs and shape them to be ornamental. This is a good idea as they are evergreen and have beautifully shaped glossy leaves. 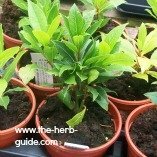 You only need one bay leaf tree in your herb garden - you will probably only use one or two leaves at a time, but a lot of people like pairs, one each side of a path or door. It needs to be shaped with secateurs - just take one or two leaves off as you need them for culinary purposes - do the pruning/shaping in spring and trim as required. Weed carefully around the base and keep the plant well watered during its first two years - after that, it should look after itself. The root system is quite shallow and you need to weed by hand if its growing in a tub or in the ground. 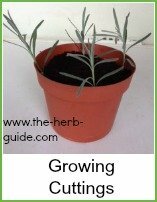 It is best kept in a tub if you can commit to the watering as it will quite quickly grow very large if you plant it in your herb border. 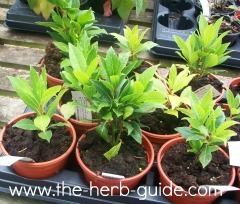 Large Bay Trees can be very expensive but you can normally pick up first year cuttings for a reasonable price. 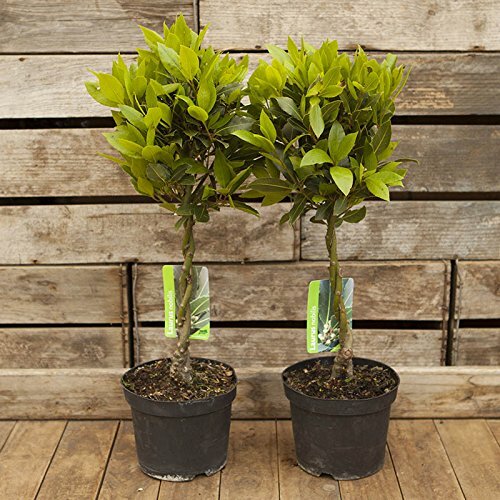 If you want to train your bay tree as a standard, then choose a plant that has just a single stem - like the one on the left of this photo here. This one, although small, will be easily trained into a standard with a single straight stem and a ball of foliage on the top. You strip the lower leaves off as the stem grows - leave the growing tip. When it reaches the height you want, then nip out the growing tip and let the plant bush out from there. It's a long slow process. You can buy them ready trained of course, but the price will be significantly more. The two trees here are for sale on Amazon.co.uk - depending on the time of year, you'll be able to find something but it WILL be expensive. Click on the flags below to see what's available now. Buy a one or two year old plant and plant outdoors in mid to late spring. Pick a sunny but sheltered spot if that's possible in your garden. Any reasonable quality soil will do - but dig a good sized hole and add some compost at planting time to get it off to a good start. Keep the tree clipped - a lot of people make them into either a ball, cone or pyramid. You can propagate by layering, seed or cuttings. If you just want one bay leaf tree, then it's best either to beg a cutting from a friend (summer/autumn is best) or buy a plant. However, you can grow them for profit by planting seeds or layering a tree you already have as well as taking cuttings. Seed germination can be erratic and take up to 3 months to grow. 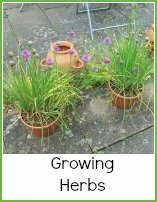 The best advice is to to sow the seeds and leave the pot alone - if they germinate, that's great. Give them tender loving care for a year or so - the bay leaf tree is a long term project - then you will be able to pot them on and sell them. Layering, growing from seed and cuttings are covered in the Growers Dictionary section. All methods will take at least a year until you have a viable plant for your own use and two to three years before they are saleable. However, in the UK, a small bay leaf tree will cost from £29 upwards - start to shape them (and they'll be three or four years old by then) and you can pay £50. 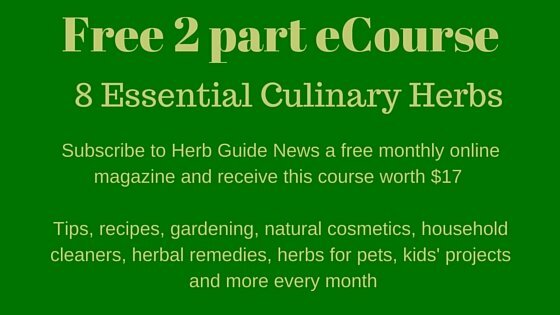 It certainly is a 'grow herbs for profit' specimen. All you need is space, time and patience. The trees are slighly tender in the northern hemisphere, they are also prone to wind burn. The bay may not survive a harsh winter and many people move them indoors if the weather is really bad. It does need a sunny but sheltered spot to thrive as it is a mediterranean herb. If you've been lucky enough to inherit a bay tree but it's out of control, then your actions will depend on what state it's in. Bay trees can grow very large - if it's massive and you don't want it, then take some cuttings, pick some leaves to dry and then dig it up - a bit drastic, but bay trees can grow to 40ft (12m) tall. If it's just wind burned or a bit leggy, then clip it into a nice shape and see if that restores its health. Give the roots a dressing of fertiliser after weeding - it should revive nicely. However, if it doesn't, then take some cuttings to replace it and dig it up - maybe transfer it to another place in your garden if you have the space.